I really like this card. Thanks to you, I now know about another challenge to follow, if I can remember LOL. Love the close up pic of Laila - such beautiful eyes! So glad that this past week has been better for you. I think about you often. Such a sweet card! I love how you perched the bunny on the sentiment! Thanks so much for joining us at Avery Elle's Challenge! Rita, I came to your blog from the SCS forum on blogs. I think you have a great balance of personal information and your great cards. I love your style! And your daughter is just adorable. 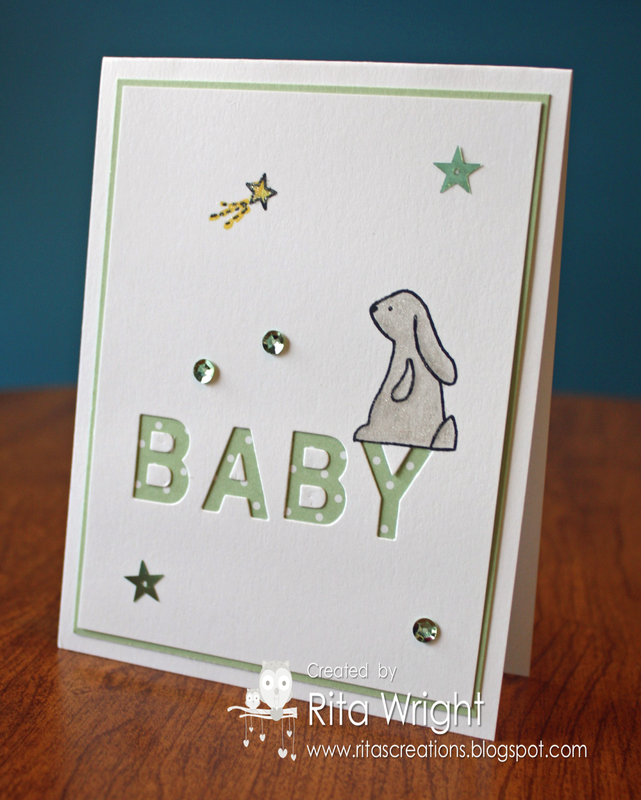 Your card is one of the sweetest baby cards that I've seen...! And Miss Laila...her eyes are fabulous and stunning...had to laugh at dad's description of T&T...not quite but she could win a competition with out all of the make up and expensive and fancy clothes....she is your Princess! such a pretty card! Love that negative die cut sentiment. Thank you for joining the AE Challenge! Your card is adorable! Thanks for playing the AEI♥U Challenge!